Have You Seen the Air Plants? What are those nifty spidery plants? Air plants or tillandsia, have invaded! We love these plants for their funky form and carefree maintenance. These elegant little bromeliads make great additions to offices, dorm rooms, living rooms or just about any indoor space with bright indirect light. You can mount them on bark, cork, and rock, or hang them with fishing line to create a unique look. They can be tucked into shells, glass globes, ceramic holders or almost anything you have around the house. Try them on place settings or in centerpieces. Let your imagination take wing! They are epiphytes, which means in nature they attach themselves to trees or rocks, absorbing water through their leaves. They do not require soil and should not be planted. Temperature: Tillandsia can withstand temperatures as low as 35 degrees, but they prefer to be in the 70s to 90s. Light: Outdoors, place in bright indirect sun and good air movement. Early morning sun is tolerated. Indoors, provide bright indirect light to filtered sun. Watering: Water two to three times weekly by heavily misting the leaves until water drips off. You may need to water more frequently if indoors in drier air. Allow plants to dry completely between watering. Soil: Do NOT plant air plants in soil. Mount them on wood, rocks, trees or hang with wire or fishing line. Avoid wrapping the base of plants in moss as it will not allow the plant to dry. You may mount air plants to wood or rock with a sturdy adhesive such as Liquid Nails or wire the plant to the base. Eventually the plant will attach roots and anchor to the mount. Fertilization: Fertilize once a month by saturating with a dilute solution (1/4 tsp. per one gallon of water) of a balanced fertilizer. They are especially sensitive to overfertilizing. Blossoms: Tillandsia will bloom once during its lifetime and in general is not fragrant. 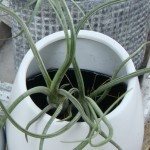 Fortunately, most tillandsia will have offsets or pups around the base of the mother plant that can be separated once they are about half the size of the original plant.